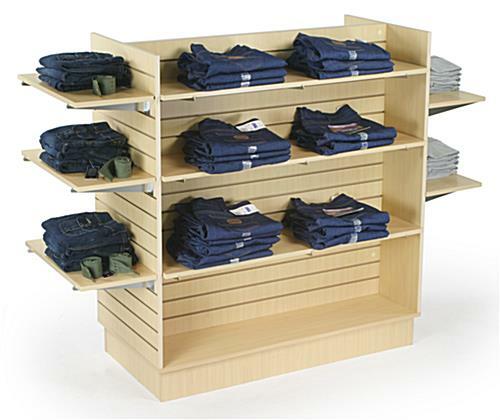 These slatwall merchandisers hold an incredible amount of clothing or other products! One of our most popular items, in stock and ready to ship! 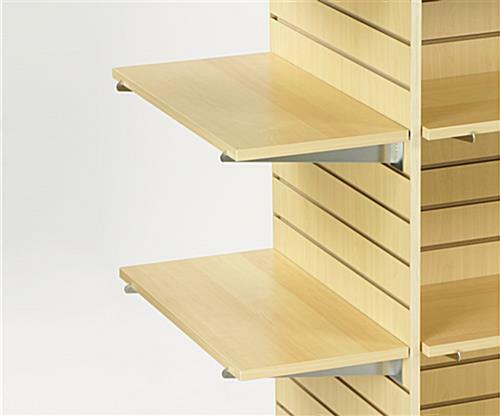 These slatwall merchandisers combine our H-gondola with three rows of display shelving. You have the capability to showcase a lot of goods on this fixture! These gondola displays, slatwall merchandisers are standards of the industry and are commonly seen in many retail shops. 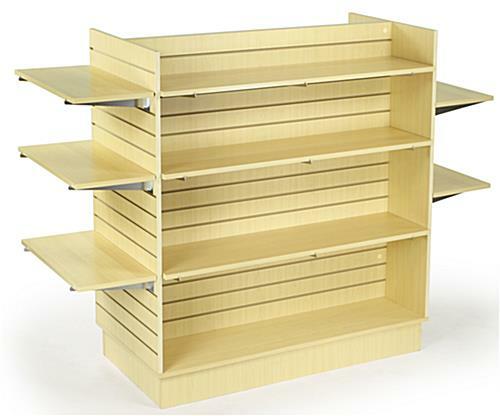 The shelves are manufactured from melamine and feature an attractive maple wood finish on all four surfaces. These slatwall merchandisers offer a quick solution once assembled; start adding your offerings right away! Overall size of the fixture is six feet long by two feet wide and four feet high. These slatwall merchandisers, including store fixtures and display gondolas, will highlight clothing, housewares, food snacks, or just about anything you want. The handsome maple wood finish presents your items fashionably. These slatwall merchandisers come with the necessary steel supports for the shelves to create the complete display pictured here. The fixtures are manufactured to the highest standards as a mark of quality. These slatwall merchandisers ship out unassembled by truck. Note: Two person assembly is recommended. Please Note: Slatwall Accessories are NOT included with this fixture.